We set a new record low and a new record low high yesterday. Last night we had frost warnings. It’s time for the ooey-gooey food recipes and I am soooo ready! A lot of times, I’ll toss up a recipe because I want to try it and putting it on the blog is way for me to find it again. You don’t want to see my recipe box. TRUST ME ON THIS!!! Well, with all the early cold, I thought this dish would hit the spot and man, did it! It is Lawyer Guy approved so it’s been added to our rotation of regular recipes. Total Time: 1 hr. 25 min. Bring together two Italian staples with our Easy Ravioli Lasagna. Prep time for this Easy Ravioli Lasagna is just 25 minutes. Buon appetito! 2 lb. frozen cheese ravioli, uncooked. Use the large, not mini, frozen ravioli to prepare this delicious recipe. I used the Bertoli fresh ravioli. Brown meat with vegetables and garlic in large skillet sprayed with cooking spray on medium heat. Stir in pasta sauce and water; simmer 5 min., stirring occasionally. Spread half the meat sauce onto bottom of 13×9-inch baking dish sprayed with cooking spray; cover with half the ravioli. Whisk cream cheese spread and milk until blended; spread over ravioli. 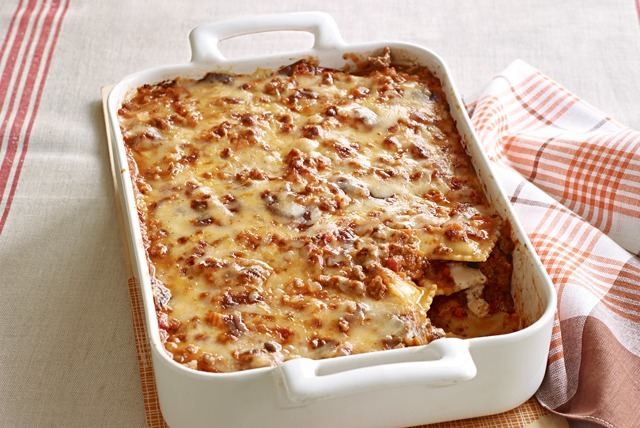 Top with layers of 3/4 cup shredded cheese, and remaining ravioli, meat sauce and cheeses; cover. Bake 50 min. or until heated through, uncovering for the last 10 min. Let stand 10 min. before cutting to serve. Note: I used the non-stick variety of foil, but still hit it with cooking spray before using to cover the lasagna. This will help prevent the foil from sticking to the melted cheese on top of the baked lasagna. I can heartily recommend this recipe. As always, head over to KRAFT RECIPES to get all the extras. This is a dish that any of my characters would chow down on. When I asked who’d made it, Lainey Walker Hilton raised her hand. Y’all will remember Lainey from NIGHT MOVES, book 2 in my Nightriders MC series. She and Hollywood are raising her twin brothers and the men in her life love this dish. She has to double the recipe because a Wolf and two growing teens? Yeah… You can read Lainey’s and Hollywood’s love story by clicking on the cover. If you have a Kindle Unlimited subscription, you can read for free. This entry was posted in Writing Life and tagged books, characters, food, links, Nightriders MC, reading, recipe, Tuesday Treats. Bookmark the permalink. Oh, that sounds decadent. Yum.